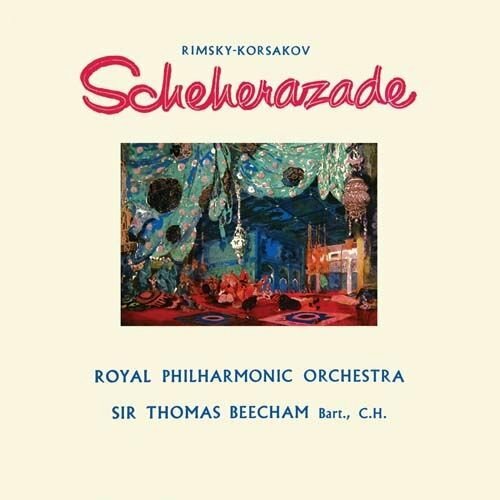 Scheherazade, also spelled Sheherazade, orchestral suite by Russian composer Nicolay Rimsky-Korsakov that was inspired by the collection of largely Middle Eastern and Indian tales known as The Thousand and One Nights (or The Arabian Nights). Exemplary of the late 19th-century taste for program music—or, music with a story to tell—the piece evokes an image of Scheherazade (Shahrazad), the young wife of the sultan Schahriar (Shahryar), telling tales to her husband to forestall his plan to kill her. Colourful and highly varied in mood, the work has a recurring violin solo that represents Scheherazade herself and a deep, ponderous theme that corresponds to the sultan. The composition was completed in 1888, and it premiered on November 3 of that year, in Saint Petersburg, with the composer himself conducting. 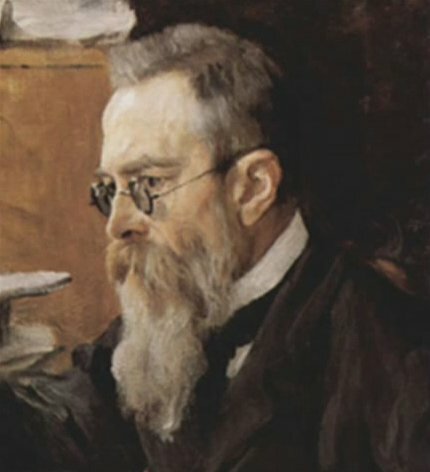 The suite is structured in four movements, which originally were untitled but later were given names by Rimsky-Korsakov’s former student Anatoly Lyadov. 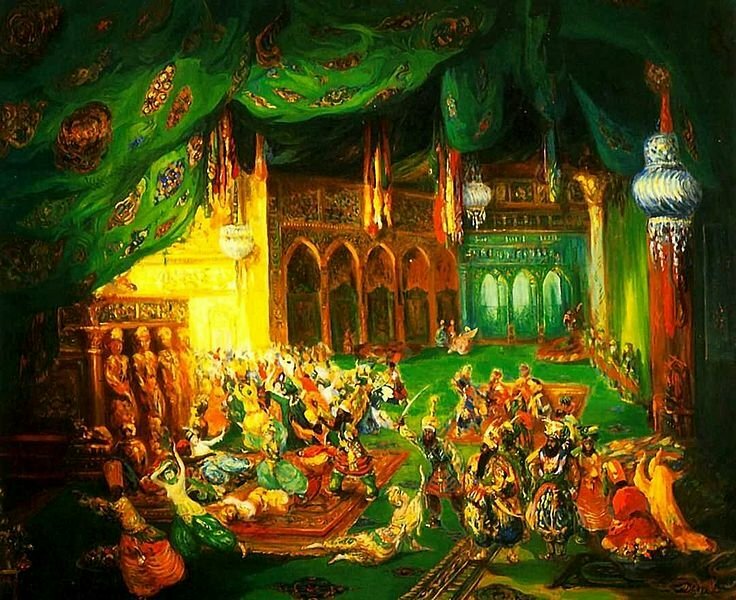 The first movement, “”The Sea and Sindbad’s Ship,”” starts with the deep, formidable “voice” of the sultan in the winds and strings, calling for his newest wife to entertain him; Scheherazade, represented by a light, lyrical solo violin melody, begins to develop her tale. The second movement, “”The Story of the Kalandar Prince,”” opens with Scheherazade’s now familiar violin line, which dissolves into animated marchlike passages, intermittently interwoven with suggestions of the sultan’s theme. The whimsical third movement, “”The Young Prince and the Young Princess,”” recounts a love story in waltz time. The theme of the sultan, now somewhat less foreboding, introduces the agitated finale, “”Festival at Baghdad; the Sea; the Ship Goes to Pieces on a Rock Surmounted by a Bronze Warrior,”” which revisits and recasts many of the themes from the preceding movements. 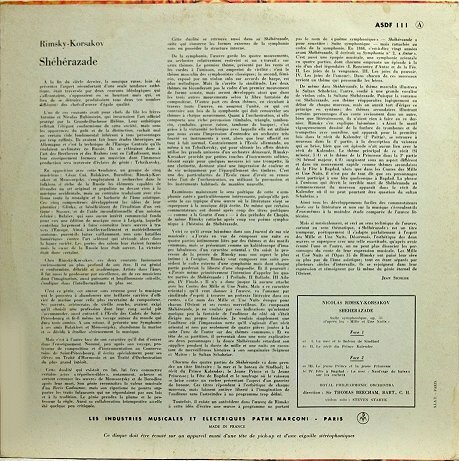 Rimsky-Korsakov’s ‘Scheherazade’ is a wonderful, intoxicating piece of music. Standing as the composer’s most beloved composition, its picturesque Orientalism–realized through brilliant, inventive orchestration and an outpouring of exotic melody–lends itself perfectly to conductors’ varied styles. Listeners adore comparing performances–invariably, Reiner’s recording is extolled for its technical excellence, Stokowski’s for its mysticism, and Svetlanov’s for its 100% genuine Russian bombast. 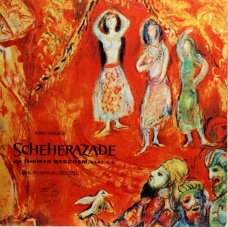 Yet, even in such a crowded field, this present performance by Sir Thomas Beecham is perhaps the most universally admired recording of ‘Scheherazade.’ In fact, it is so admired that even the colossal ego in Herbert von Karajan initially declined to record the work, remarking that Beecham’s interpretation could not be improved upon. Frankly, the praise is bit overdone. This is not to say that this is a bad recording–by no means! 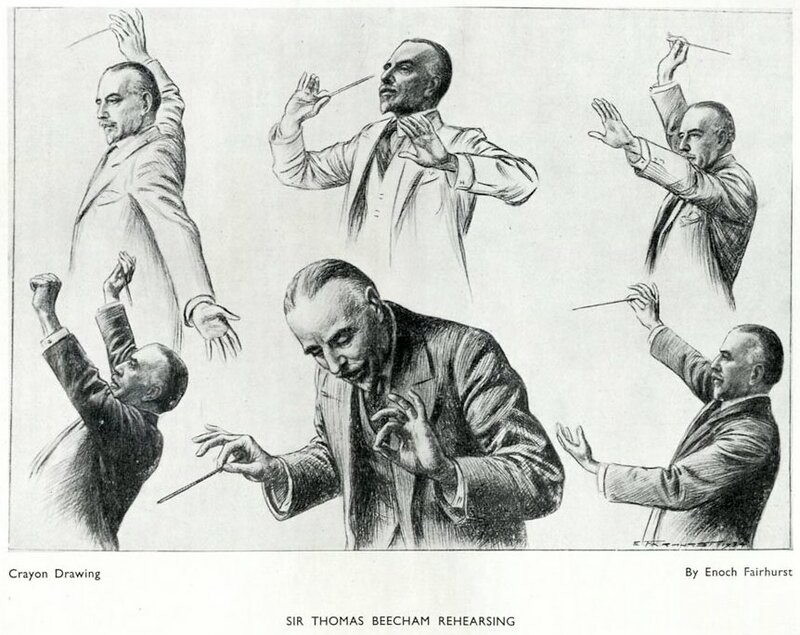 Beecham was one of those conductors who could seemingly do no wrong, and there is certainly nothing wrong here, per se. 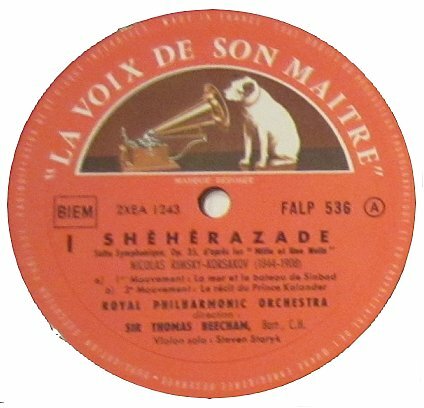 But for comparison, let us draw upon one of Scheherazade’s very best performances–Ernest Ansermet’s lamentably rare 1954 recording with the Paris Conservatoire Orchestra. Take the opening few bars. The Sultan’s theme roars out of the brass, and Scheherazade’s voice–symbolized by the haunting violin solo that unifies all four movements–responds, spinning the first of her tales, ‘The Sea and Sinbad’s Ship.’ Beecham’s opening shows the maestro in classic form, smoothly propelling the metallic, ominous sound of the brass with a very musical and masculine snap. And his violinist is very good, depicting our heroine with seductive style. In contrast, Ansermet’s sultan is bit less forceful, a bit warmer and more balanced with the strings and reeds. His sultan has just a little more weight around the middle and strides in purposefully. Ansermet’s violinist plays swiftly, with considerable freedom and feeling–in his hands, Scheherazade’s’ feminine voice coyly convinces the sultan to pause and listen. In the second movement, ‘The Story of the Kalendar Prince,’ Beecham’s bassoon soloist is really very good, aptly injecting a bit of awkward character into his solo without sacrificing rhythm. The strings are very elegant. And the maestro’s same, classy, snappy phrasing works wonders in the faster parts of the music, particularly in all those wonderfully rousing orchestral strikes towards the end where his wide dynamic range really comes to bear. Clearly, Beecham has the superior orchestra and they play the pants off this music. Yet, Ansermet somehow makes his comparatively sloppy ensemble sound more appropriate–the fluttering, less precise winds are the voices of his characters, and the lighter, thinner strings are the dust and air they breathe. With them, he takes full advantage of Rimsky’s colorful and atmospheric orchestration, defining each melodic line with unerring clarity. And these trends continue. In the third movement, ‘The Young Prince and the Young Princess,’ Beecham is all elegance and charm, making a tasty “Beecham bon-bon” of this romance. And his clarinetist depicts a lovely princess indeed. But Ansermet’s is a lighter, sweeter, and more innocent pair of lovers–by comparison, Beecham has too little fairy tale and a bit too much Tchaikovsky. Is that such a bad thing? Well, no, actually it’s great, and no one could ever say that Beecham’s conception lacks character. But Ansermet’s storytelling is second to none. The last movement, ‘The Festival of Bagdad – The Sea – The ship goes to pieces on a Rock surmounted by a Bronze Warrior,’ with its mad dash to finish line and final moments of redemption, suits both conductors just fine. Beecham displays typical panache and energy, galloping through with a palpable sense of fun and arriving at a most sensuous conclusion. Here, his superior orchestra really does give him an edge. Still, Ansermet handles himself well, with the Baghdad festival coming off as quite a ragtag affair and the orchestra’s bright, blaring trumpet intruding in a wonderfully impetuous way. In short, both recordings are excellent, but neither is the end-all performance. Beecham provides a vivid musical picture of a far away, exotic, spice-filled fantasy world. Ansermet provides a threadbare magic carpet and takes you there. The “filler” of Borodin’s Polotsvian Dances are hard hitting and very exciting, demonstrating essentially the same qualities as Beecham’s ‘Scheherazade’ but in music even better suited to them. The appearance of the Beecham Choral Society is a plus. The sound is typical 50’s–clear and very closely miked. The bass is a little weak, but not unacceptable. thanks to Arabella for the tip !